Located at the geographic crossroads of Asia, Europe, North Africa and the Middle East, Israel is a kettle of culinary confluence. 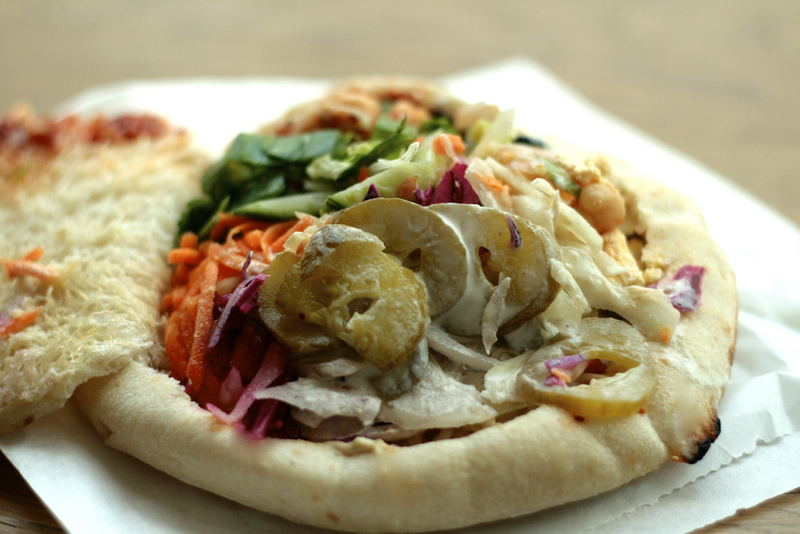 Perhaps the best embodiment of the global influence on contemporary Israeli cuisine is the humble sabich. What is sabich? A sandwich, yes, by most definitions, but also a citizen of the world, a uniter of cultures, an heirloom of a tradition of traipsing and transience. But before we get too lofty, the tangibles: Sabich, practically speaking, is a sandwich sold on street corners and in shops across Israel. It’s a pita stuffed with fried eggplant and a hard-boiled egg, then topped off with typical Israeli accoutrements: hummus, tahini, cucumber and tomato salad, pickles, plus a dousing of a mango pickle dressing called amba—itself a legacy of close ties between Jewish traders in Iraq and the Indian subcontinent. Sabich came into being as an Iraqi Shabbat breakfast; with cooking forbidden, Iraqi Jews would eat meals of already-prepared eggplant, potatoes and eggs. “It’s unclear why it would have been popular only among Jews,” says Ari Ariel, professor of Hebrew and Judaic Studies at New York University. “These are standard foods—pretty universal.” When many of Iraq’s Jews moved to Israel in the early 1950s to escape increasing anti-Semitism, they brought along their foods. It was in the Tel Aviv suburbs of Ramat Gan and Givatayim, where Iraqi immigrants settled, that sabich, now wrapped in the ubiquitous Middle Eastern pita, found a home. And not just in Israel—Mediterranean street food has its own diaspora now. Sabich, falafel and the like have put down roots in New York City, home to some 500,000 Israeli immigrants. Ever since the restaurant Taim opened in New York’s West Village in 2006, owners Einat Admony (an Israeli native) and her husband Stefan Nafziger have been bringing sabich to the masses. Their menu is part of a burgeoning epicurean scene that celebrates everyday Israeli foods. Hummus Place—with four New York locations—launched in 2004 with the intention of serving only the chickpea dip, but has since added both sabich and shakshuka—an Israeli by way of North Africa dish of tomatoes, peppers and eggs—to the menu. The simply named Chickpea also offers sabich and (of course) hummus. The craze is spreading beyond the boroughs; the sandwich shop Butcher & Bee in Charleston, South Carolina (owned by Israeli Michael Shem-Tov) peddles sabich to Southern belles and gents.